Feet can be tricky to draw, but they can be drawn using the same techniques used in the post about drawing hands. 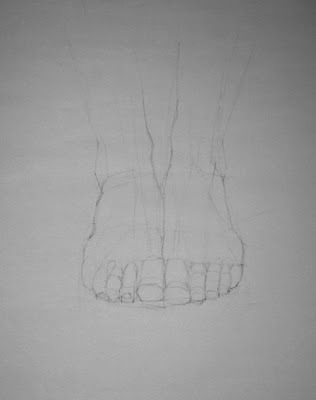 Today's post will demonstrate how to draw a foot or feet by finding the simple shapes and planes of the foot. The image to the left is the final result of the step by step demonstration we will do. 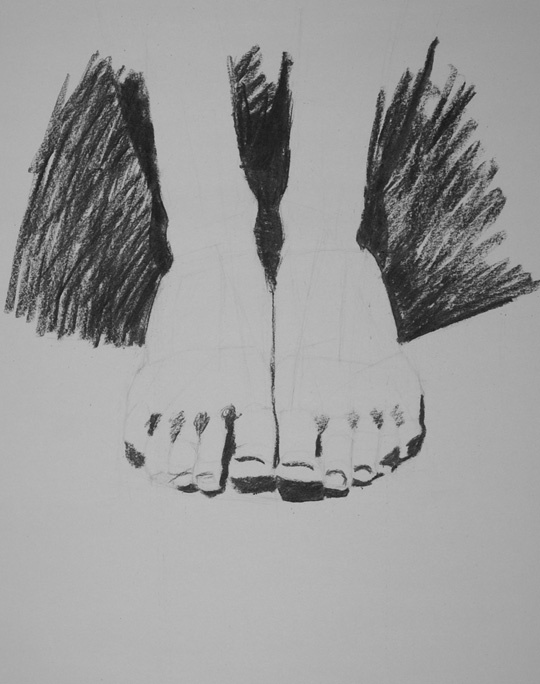 Before we get into the drawing demonstration, lets look at the forms and shapes made by the foot. A foot seems simple enough as it is basically a wedge, but often we see the foot in foreshortened perspective and this changes the form as we see it from a particular vantage point. So it is best to understand a little about the shapes and planes of the foot as seen in perspective. Lets take a look at the foot. Below you will find the foot as seen from four different views. The most basic shape the foot creates from these views has been drawn over the foot. As you can see from the side the foot is a wedge shape. 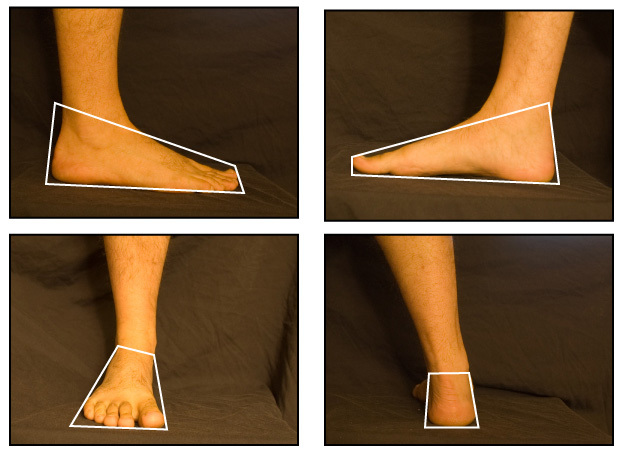 The images of the foot seen from the front and the back are examples of the foot seen in perspective and the wedged shape foot becomes compressed and takes on a new basic shape. The foot is more complicated than a wedge as it breaks down into even more structural form. Below you can see the foot creates slightly more complex shapes. Notice how the shapes follow the skeletal structure. Again, you can see an example of a foreshortened foot in the image on the right. Here the length of the foot is compressed visually and the shapes change to match the compressed view. We rarely see the foot as we do in these examples. 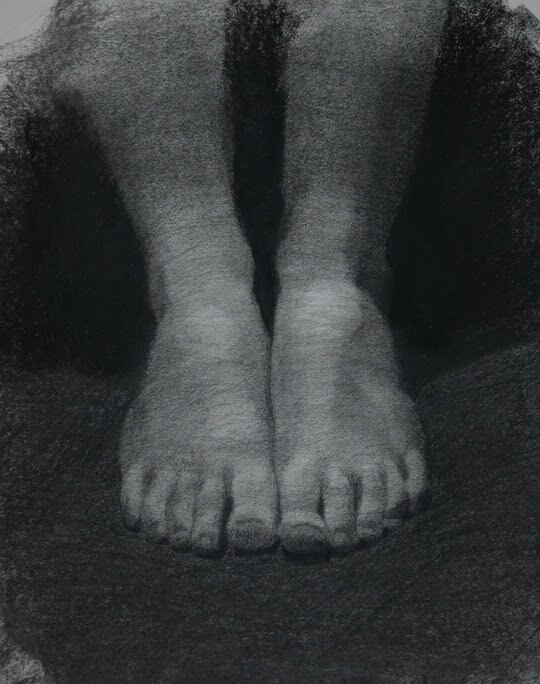 Usually we are looking at the foot in perspective, meaning the foot is generally below eye level and is usually foreshortened based on it position in relation to the viewer. So today's in demonstration we will be looking down at the feet as they face towards us. This will illustrate how looking for the shapes and structural planes of the foot will help us draw a foreshortened foot in perspective. First block in the overall simple shapes you see in the feet. Here we are finding the basic size and proportions of the largest structural elements. Keep you pencil lines light.  Drawing too dark at the beginning can cause problems as the structural lines will show through the final drawing. Start looking for the smaller shapes within the foot, using the larger shapes you just laid down as a guide, work your way down in scale. Look for the larger shapes first, then move to smaller shapes, and then to even smaller shapes. 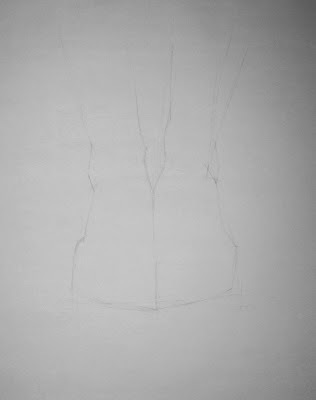 As you refine the shapes, at some point the shapes you will be looking for are the surface planes. The shapes of the surface plane represents where the surface of the foot changes direction. Next draw in the shadows. This step will guide you as you begin to render the form. Drawing the shadows will give you a good idea of how accurate your structure drawing is. I use a vine charcoal for this step. It makes it easier to correct any errors at this stage. 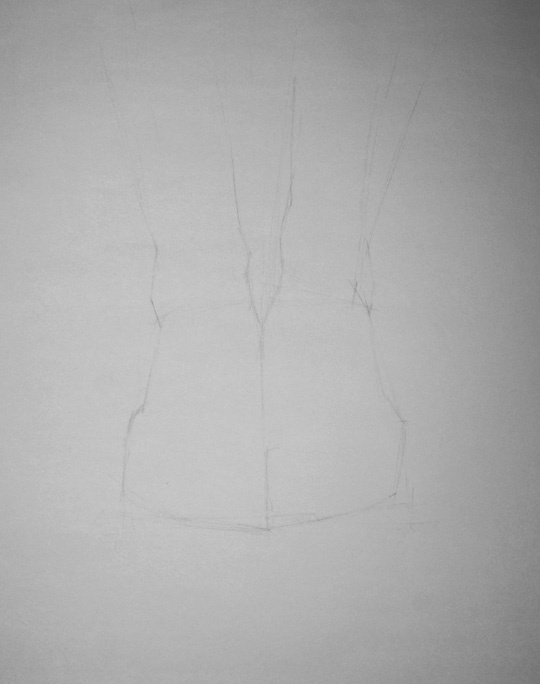 Begin to render the form. 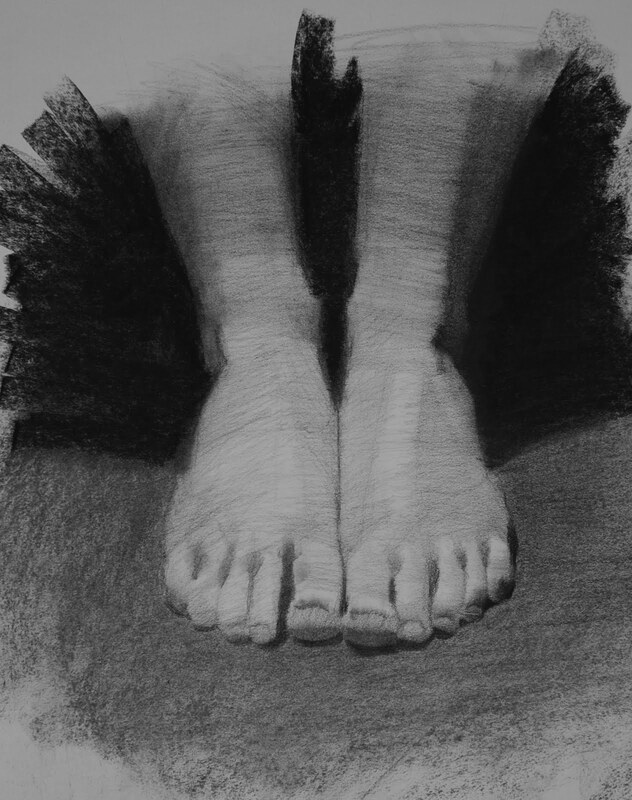 In this drawing I used HB, 2B, and 6B charcoal pencils to start shading the planes to render the form. I also used a soft compressed charcoal stick and more vine charcoal to deepen the values of the drawing. Continue the process of rendering and refining. Take it slow, work lightly at first then build up the values as you draw over your structure drawing. Though the foot can be challenging to draw using this method will help you better see and draw the foot. Studying the anatomical structure of the foot is a good idea as well. This will help you understand the underlying structure making up those forms.